To Draw Attention to this special Tent Eventrics Hired us to put a Giant 3 ft balloon topiary Column on their tent with Ribbon to Blow in the wind. 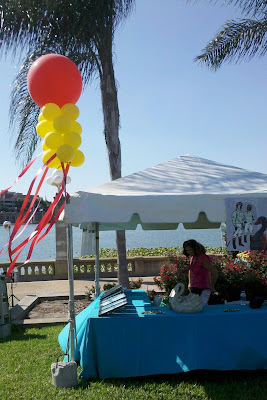 Many Times we get calls from clients requesting Helium balloons for their outdoor events. After years of experience and training in the balloon industry we are able to offer more practical Air Filled decor that is supported by steel and can have their own base plates or in this case be attached easily to the tent pole. So instead of your balloons blowing over in the wind -- the Accenting Ribbon Blows in the wind to add extra color and draw peoples attention to the area you want them to see. Email partypeoplecc@msn.com or call 863-255-2025 to order decor for your next celebration.